The other day, I made some suggestions about how you can make sending a packed lunch to school easier and less stressful. Today I am going to make suggestions as to what you can actually put in that lunch box. I am not going to suggest quantities to send, you know your child best, and know how much he or she will eat… and besides, my 9 and 11 yr old eat far more than my 15 year old does. And I am sure that a teen boy who is playing sports would eat more than all 4 of my girls combined! And a tiny pre-schooler will eat not much more than a few bites of any one thing. If the lunchbox comes back empty and your child is starving at the end of the day, you know to send in more. If they left half their lunch, try sending in a bit less…. I suggested the other day that you cook extra the night before and send the leftovers for lunches. In general, that will be a fairly balanced meal depending on what you have leftover. Don’t forget, soups and chilli and many other dishes can be reheated and sent in an insulted food jar. Others could be sent in a microwave safe container if your child has access to a microwave. And some are just as good cold as hot. If you would eat it cold out of the fridge, why not try sending it to school as a lunch? Just because you and your children don’t eat bread doesn’t mean that sandwiches and wraps are off the menu. Use hollowed out cucumber or celery sticks as the “bread” and fill with sliced meat and salad veggies as in this great recipe. Apple slices make a great bread substitute when using nut butter. Make sure you dip the apple in a mix of lemon juice and water to prevent them from browning. Red Bell Peppers can also be used in place of a “bun” as in this recipe. Portabello mushrooms have been used as the bun for burgers many times. Why not use them in place of bread in a lunchbox sandwich? Or you could simply make a paleo bread and use that for sandwiches occasionally. 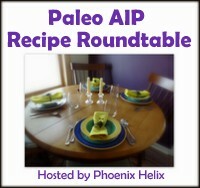 There are many paleo bread recipes out there. Some low carb others quite high in carbs but gluten free. Given that most kids need extra carbs, I favour this recipe. You do have to pay for it, but I figure that $3.95 is pretty cheap for such a versatile recipe! Use deli meats as a wrap for veggies like in this recipe. Another suggestion is to use thinly sliced roast beef, spread with a little mustard and horseradish and then rolled around veggies. Avocado would be especially good! Use the Magic Dough recipe I mentioned earlier to make tortillas to use as a wrap. Make a thin omelette or crepe and use that to wrap veggies and meats. But you don’t just have to send sandwiches or sandwich substitutes. Consider going down the bento box formula and sending a protein ingredient with a couple of sides and maybe a treat or some fruit…. Aim for one protein, a couple of sides (veggies), some fruit and an occasional treat. Make sure that there are plenty of good fats (eggs, avocado, coconut, nuts and nut butter, olives, olive oil, oily fish even cold cooked bacon) as it is the fat that will help keep them full until home-time. Eggs – either hard boiled, as mini-frittatas, crustless quiches or spanish omelette (or tortilla to give it it’s correct name). 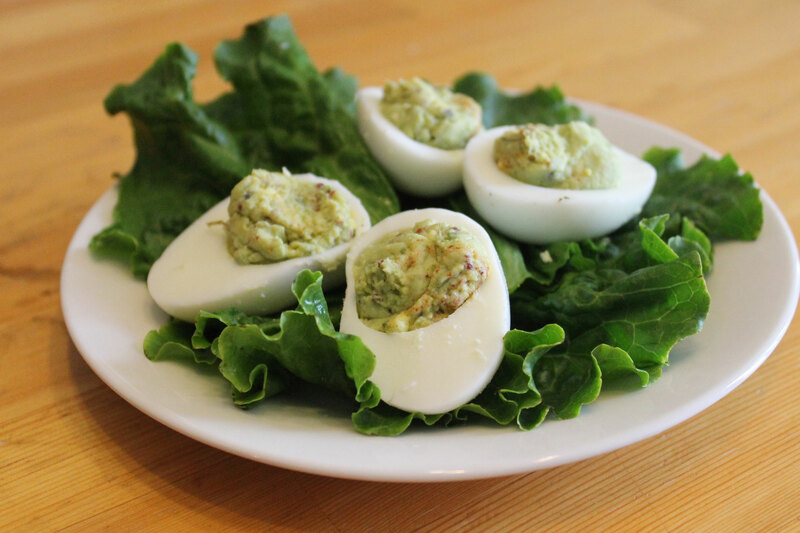 Stuffed eggs or devilled eggs are good too. And don’t forget egg salad made with homemade mayo. Cold cooked meat – this could be leftovers from the night before or cooked especially for the lunchbox. Cooked chicken is wonderful when cold – wings, legs especially so, but even leftover breast meat is good. Paleo versions of chicken nuggets are also popular especially if you provide something to dip them in. Leftover ribs are tasty, especially if you supply some of the BBQ sauce for dipping, as is cold sliced beef. Use some sliced deli meat if you can find some that is nitrate and sugar free. You could even cook a ham or roast some beef specially for lunches. And don’t forget cold cooked sausage or bacon. Cooked burgers or meatballs (with or without a sauce) are another suggestion provide a dip if you think it would work. Home-made kebabs are another alternative that are fun to eat. And speaking of kebabs, these are a fun choice, alternating deli meats with veggies on a skewer. Something most kids are sure to love! If you include dairy in your child’s diet you could add cheese cubes as well! Fish – yes fish can be served cold. You could send in a can of tuna or sardines with older kids, and for the younger ones make tuna salad with homemade mayo. Even leftover Paleo Fish Sticks could work well cold with a tartar sauce made with homemade mayo or Paleo ketchup. Nut butter and nuts will provide some protein and healthy fats if your school is not nut-free. Otherwise, just send in a small amount of nuts. Remember that nuts, with the exception of macadamia nuts, are very high in omega 6 fatty acids, and should be more of a condiment… if you cannot obtain macadamia nuts, consider walnuts – they have a better omega 6 : omega 3 profile than most other nuts. Spread nut butters on a paleo friendly cracker and top it with another one to make a paleo version of PB sandwich… or try these apple-sandwiches with nut butter between 2 apple rings. You can also use nut butter as a dip for veggies such as carrot sticks and apple slices. 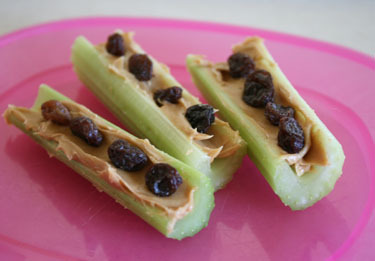 Try spreading various nut butters in celery sticks and top with raisins or dried cranberries for ants on a log. And if your school is nut-free, consider using Sun-butter as an alternative. Dairy – if your child tolerates dairy well, this could be a good source of protein in their lunch. Consider sending in cheese cubes or sticks. Cheese on a skewer with fruit is wonderful – that sweet and savory thing… just make sure that it is not highly processed cheese. And for preference go for organic, and pastured dairy… if you live in an area where you can purchase raw cheeses (not possible in much of Canada), do that… it is surprising what kids will eat. Mine LOVE stinky cheese and those with big flavours, feta, brie Camembert, Gorgonzola… don’t assume you have to buy cheap flavourless processed cheese to appeal to a child’s palate. And like everything else, read labels… Cream cheese can be spread on celery sticks and topped with dried fruit to make a nut-free version of ants on a log. Cold cooked veggies, leftover from the night before. Sweet potato wedges/fries are especially good, but don’t forget about other roasted veggies (beets, carrots even parsnips). Cold broccoli and cauliflower tastes good, especially with a dipping sauce. Even cooked asparagus would work. Raw veggies with a dip. Choose from carrot sticks, baby cucumber, cherry tomatoes, celery, bell peppers, broccoli, cauliflower, cucumber, radishes and anything else that you think your child would eat. Salads are also a good side, and pair especially well with chicken, eggs and sliced meats. Send the dressing in separately in a small pot or jar so that the leafy salad veg does not go limp. A fermented side such as lacto-fermented pickles, sauerkraut or kimchi tastes good and provides some healthy gut-friendly bacteria. Stuff tuna or egg salad into a de-seeded bell pepper or a hollowed out tomato. Fresh fruit is a great addition to the lunch box. Pretty much any fruit that your child likes can be included whole or sliced. If slicing apples, remember to dip them in a mixture of lemon juice and water to prevent them from browning. Kids almost always love these, but they are not usually all that great, so include them only occasionally. Dried fruits – dried apples, dried mango, dates (stoneless are best), raisins, cranberries, apricots. Check to ensure that the fruits have not been dipped in sugar – a surprisingly large amount are, which is crazy seeing how sweet dried fruit is anyway! Chips – try kale chips, plantain chips, sweet potato chips, or any other home-made veggie chip that you can think of. They are easy to make, slice the veggies as thinly as you can (for kale chips, rip into small pieces) and bake the veggies in a low oven until they are crisp… add seasonings as you feel necessary. Kale chips will take only a short while (less than half an hour), sweet potato or plantain chips may take upward of 2 hours depending on how thick they are. Watch them carefully so that they do not burn. A small square of dark chocolate or a few chocolate coated raisins or almonds. Aim for 85% cocoa solids or better in the chocolate. pudding such as my chia puddings. You can flavour these with any fruits you like. The best thing you can send for lunch is plain water. If your child won’t drink that, try flavouring it with lemon juice or even making a flavoured fruit water. Another suggestion is to send cold milk in a thermos – use cows milk if your child tolerates that, but also consider almond milk as an alternative. Older children might like unsweetened iced tea or herbal teas (hot or cold), and if they have access to hot water you could even send an unbreakable mug such as a travel mug and a couple of tea bags. This entry was posted in Family, Food, Paleo basics, School lunches and tagged back to school, gluten-free, grain-free, healthy, kids, low carb, packed lunches, paleo, primal, school lunches, sugar-free, what to send. Bookmark the permalink.